65’ - FK comes in from Powers and Frei noms noms noms nom. 66’ - And another foul on the Sounders in a good spot. Rapids just racking up the FKs here. 66’ - 39,757 is your attendance tonight which is a very high number. 66’ - Another one in from Powers and Frei just noms it up so hard. Almost too easy. 67’ - Back at the other end, Roldan gets an inch or two of space and rips one just wide. Good effort from the lad. 68’ - Roldan AGAIN! Working hard against Harrington on the near side, slides into the box and rips one that Watts blocks. He’s feeling it. 69’ - Roldan tries to get behind Burch following the nice ball in from Deuce but Burch with a lovely slide tackle..
70’ - And with that, Roldan’s night is done and on comes CHAD BARRETT. HI CHAD BARRETT. 71’ - #LeoBall to a DEMPSY SCISSOR KICK OH MY GAWWWDDDD. 71’ - Which is sent in and cleared for a throw. 72’ - OBA RIPSSSSSS ONE…deflected for a corner. Sounders turning it on right meow. 73’ - Sent in by Pappa but Irwin takes. Lamar set to check in. 73’ - Sam Cronin, smart foul. Sees Obes about to run right by him so he just cuts off the angle and gives him a hug. 74’ - Subs here. Sanchez on for Powers. NEAGLE on for PAPPA. *the more importante one in CAPS. 76’ - Dempsey with the chance on his left as the ball slides into the middle. His shot is taken by Irwin with confidence. 77’ - HOLY MOLY THAT WOULD HAVE BEEN SOME GOAL RIGHT THERE! Dempsey and Oba doing there thing, Dempsey rounding the keep, a player, wide. 79’ - On a throw, Oba dummies to Dempsey who passes back to Oba. I mean come on. 81’ - Sounders passing. So hot right now. Sounders passing. 82’ - There are eight minutes remaining. 83’ - Change for Rapids as Doyle off and Eloundou on. Ok.
83’ - Deep shot there by Ramirez after he squirms his way around Ozzie. Frei save. As is tradition. 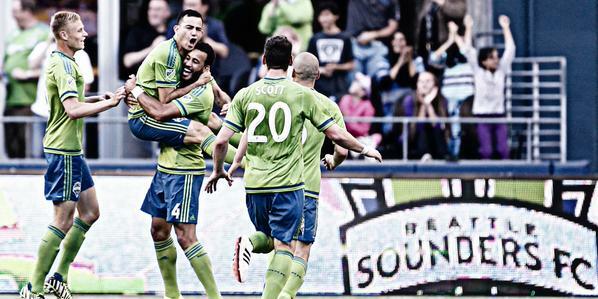 84’ - Sounders up 1-0, friends.